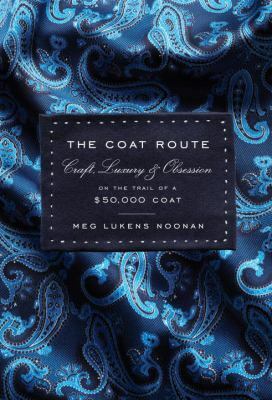 The Coat Route: Craft, Luxury, & Obsession on the Trail of a $50,000 Coat by Meg Lukens Noonan. Reviewed by Louise Hilton. The Coat Route is a quick and interesting read on the making of a $50,000 coat. No, that’s not a typo. Journalist Noonan set out to discover the story behind this unfathomably expensive overcoat crafted entirely by hand and to determine the role, if any, that bespoke (custom-made) clothes play in our fast-paced era of instant gratification. Noonan journeys across the globe to trace the making of each element of the coat, from Peru (home of the vicuña, a camelid whose fleece is the finest in the world) to Florence and Paris (the lining) and finally to England (the buttons) and Australia (the thread). Fun fact: The tailor specializing in bespoke clothes who was commissioned for the coat even did the stitching for the book jacket. Noonan also gives a brief history of bespoke tailoring, especially that of London’s fashionable Savile Row, but laments that the word itself has been hijacked – there are even “bespoke” ice cream shops – which diminishes the significance of this centuries-old tradition. $50,000 for a coat is of course an obscene amount of money, and a luxury only very few could afford. But Noonan presents the story in such a way that reading about the attention and care behind this and similar garments makes you think (and cringe) about the production methods of the cheaply made clothes with the all too familiar “Made in China” labels we so often put on our backs. In the end, The Coat Route is not only a commentary on the consumer society in which we live, with its “disposable” clothes and products, but a compelling ode to artisanal industries. *An abridged version of this review was published in The Advocate (Baton Rouge, La.) on 8/17/14.